The high cost of synthetic turf sports fields compared to natural grass is finally getting some national and international publicity. Forbes has a story making the obvious point that "natural grass sports fields are a bargain compared to artificial turf due to the huge costs taxpayers get stuck with to maintain and replace artificial fields after their warranties expire". The article points out the bogus analysis and phony math used by the synthetic turf industry. Using ridiculous notions like "cost per event", deceitful charts and spreadsheets are created and used as lies attempting to show that after many years, a synthetic turf field magically becomes "cheaper" than a natural grass field. Based on our years of experience, far too many architects, superintendents, school board members and other administrators (basically anyone that WANTS synthetic turf) also use this deceitful information to convince taxpayers to pay for synthetic turf fields. It's like the magic bullet theory all over again except this time far too many people are believing it. 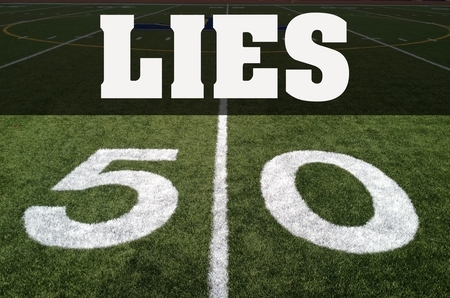 Taxpayers are presented these lies as an attempt to make the case that synthetic turf fields are needed at their school district or city when in fact perhaps the main reason is simply a case of 'keeping up with Joneses' as well as coaches and/or athletic directors want a field they think everyone can use all day every day with no negative side effects. Synthetic turf fields are fragile. You cannot simply play on them and abuse them. There are valid reasons for choosing synthetic turf field over natural grass. For instance, if water for irrigation is scarce, of poor quality or very very very expensive, then synthetic turf is likely needed. If a field's location is unique (e.g. next to the ocean) and the topsoil is persistently loaded with sodium preventing a decent stand of grass to grow and thrive, then turf is likely needed. If a school or other organization has only one field to play on with no other land options available for expansion to build additional practice areas to reduce field traffic, synthetic turf is likely needed. Even in these situations, there still is a choice to make and the decision must be evaluated to determine whether if choosing the highest priced product is worth it or not. Don't forget, synthetic turf fields need to be replaced about every 10 years...forever. The cost - usually around $400,000 as of 2014 - to replace an artificial turf surface never goes away and must be budgeted for as long as the field exists. Apparently, to many decision makers responsible for spending public money, it's completely sensible to spend ~40% of ~$1 million dollar initial up front cost every 10 years for the rest of time. It seems money really does grow on trees. It's incredible when you really think about it. For decades school districts and organizations claim they never have enough money and/or time to maintain a decent natural grass sports field but all of a sudden there are millions of dollars available to spend - in perpetuity - on a single new fragile synthetic turf playing surface that everyone claims can be used and abused with no negative side effects. Click the image below to view a sample piece of literature used to help justify a school district choosing to go with synthetic turf. Maintenance: If you avg ~$38,000 per year maintaining natural grass...you probably have a very nice sports field and the public is likely not clamoring for a higher priced replacement. There's nothing telling us where this number came from but in our experience that number is not realistic (about $10K higher than it should be). We work with hundreds of school districts across Texas and no one comes close to spending this amount even on the best natural grass surface. Maintenance / Replacement: No school district spends $100K to replace their natural grass field every 10 years. It doesn't happen. If you are in fact spending ~$38K per year in maintenance...why would you need a major renovation that frequently anyway? Water: That's actually a decent estimate for the amount of water that SHOULD be applied to an average sized football field per year if you are following good agronomy guidelines. On average, that would be ~1" of water per week. If you get above average rainfall (for Texas), the amount will be lower; with less rainfall you will need to irrigate a little more. Events Per Year and Rental Revenue: If you aren't even hosting 1 event per week (48 each year according to the chart) on a football field AND you are spending $38K on maintenance, AND you are watering properly that field would very likely be in REALLY NICE SHAPE. Again, it would be the sort of field that the community would very likely be quite proud of rather than wanting to spend a lot of money on to improve. Install: ~$1M install price in year one seems about right. Maintenance: ~$2,800 per year for maintenance? That's quite low and - if true - would be an indicator as to why a field fails within it's warranty period (see the paragraph on lawsuits below). This number should be at least twice that amount. Contrary to what an artificial turf sales person may claim, a synthetic turf field is fragile and should be regularly swept for trash, metal and other debris, groomed at least weekly to keep the turf fibers standing up along with keeping infill level, regularly sprayed and disinfected and deep cleaned at least twice per year (more, if you are hosting as many events on the field as promised during the pre-sales process and the lead up to the bond vote by taxpayers). Replacement: $315,000. That number is about $100,000 LOW. Synthetic turf surface replacements cost at least $400,000. Water: $0. That's ridiculous. For several years now, even the Synthetic Turf Council recommends an artificial turf installation include an irrigation system. In warm/hot climates like Texas, applying water on an artificial turf field temporarily relieves the insanely high surface temperatures (often in excess of 120 degrees F on the warmest days). Synthetic turf surfaces are fragile and need protecting. Liquid spills from sugary drinks promote mold growth and must be cleaned up. It's gross, but vomit, spit, blood, animal droppings all need to be cleaned off synthetic turf field regularly, often with cleaning products. These things are handled more naturally on a natural grass field but humans must do all the work to clean and reverse the effects of these negative forces on synthetic turf. Events Per Year and Rental Revenue: Ah yes, the argument that every new synthetic turf field will become this wonderful source of new revenue for years and years and years. According to the pre-sale claims and spreadsheet figures a synthetic field can host at least one event on it each day of the year and make money! IT. NEVER. HAPPENS. THAT. WAY. If a school district never thought to charge other local organizations to play on their natural grass field before (remember, allegedly they were spending ~$38K per year to maintain their field so it should be in really good shape), do you think they will start charging for access to this new, expensive, fragile field? They should...but they very likely won't. Let's say, for argument's sake, a school does charge to use this awesome new turf field. More traffic on the field means the field will need more regular maintenance, which means the field wears out faster, which means there should be far more than ~$2800 per year budgeted for maintenance (as was prescribed in the bogus numbers provided). All of these so-called data points are very disingenuous and are simply an attempt to tell a story that is not at all reflective of reality. The other startling issue brought to light in the article by Forbes is the fact that FieldTurf - one of the most successful artificial turf companies - is involved in many lawsuits with school districts and other organizations in dispute over the warranty replacement of turf fields (several of them in Texas - Arlington, Port Neches, New Braunfels, Breckenridge). Who knows how many other school districts have settled with companies like FieldTurf, costing taxpayers additional money just to keep their turf playing surfaces from being condemned. Once a school district or other organization makes a decision to spend money on upgrading it's athletic facilities, there is a choice to make regarding what type of field to install. In no situation will a synthetic turf field be cheaper than a natural grass field. Therefore, taxpayers should be informed (if not very wary) when administrators, school board presidents, trustees, athletic directors, coaches and even architects attempt to make the case that synthetic turf is cheaper and is needed. There is a choice. If new field construction is inevitable, a high quality natural grass sports field is far more affordable and will cost hundreds of thousands of dollars less when compared to synthetic turf (the cost savings will total millions over time). The up front cost is significantly less for natural turfgrass and the field will not require budgeted, high priced scheduled resurfacing. Depending on overall field traffic and regular maintenance practices, minor renovations (like re-sodding high traffic, worn areas) may be beneficial or needed on occasion. The cost of this work is minimal (usually in the tens of thousands of dollars, worst case). Be informed. Don't believe the lies.